This part encodes the production of the proteins required for bacterial luminescence including luciferase and its substrates from Vibrio fischeri, codon optimised for E. coli under the control of our blue light repressible promoter, (Pblrep). For blue light repression, cells must also express EL222 (BBa_K2332004). Naturally, Vibrio fischeri use additional regulatory proteins (encoded by LuxR and LuxI upstream) whose external concentration increases as a function of increasing cell-population density. Bacteria detect the accumulation of a minimal threshold stimulatory concentration of these autoinducers and regulate the expression of LuxCDABE. Consequently, we removed these regulatory proteins to ensure that cell concentration dependent luminescence through quorum sensing is surpassed and our cultures can fluoresce independently. Additionally, by using our blue light repressible promoter (PBLrep), we will ensure that LuxCDABE expression is only active in the dark and excess buildup of substrates and luciferase, potentially toxic, will be prevented. The blue light repressible promoter (PBLrep) consists of the 18bp DNA binding region of EL222, a natural photosensitive DNA-binding protein from the marine bacterium Erythrobacter litoralis HTCC2594, positioned between the -35 and -10 regions of the RNAP binding site . In the dark, EL222 is inactive as its N-terminal LOV domain represses its DNA-binding C-terminal HTH domain. In the daytime, exposure to blue light (450nm) results in the LOV-HTH interaction to be released, allowing it to dimerize and bind its binding region, causing steric hindrance to RNAP binding, ultimately repressing transcription. Therefore, only at nighttime the transcription of LuxCDABE will occur. We developed and prototyped a bacterial light bulb - one that uses light-induced transcriptional control and co-culturing to create an efficient and sustainable solution for public illumination that requires a minimal electricity/nutrient input. 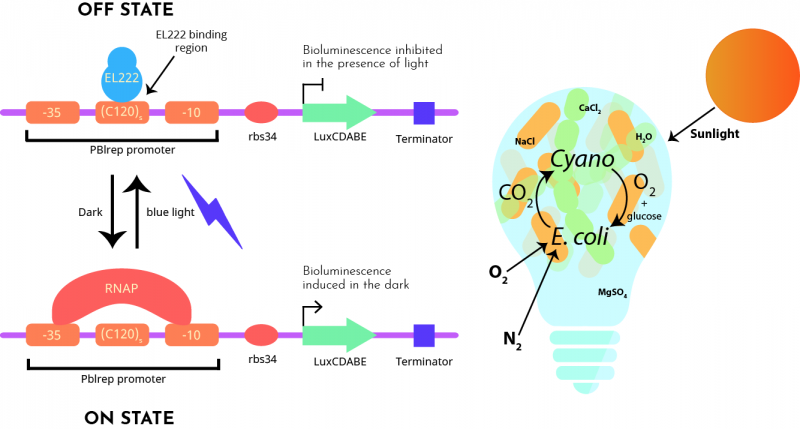 As shown in figure 1 on the right, the bulb contains light-sensitive E. coli harbouring this construct (shown on the left) and the EL222 construct to repress bioluminescence in response to sunlight levels. Thus bioluminescence is only active during night time. Additionally, engineered cyanobacteria, Synechococcus elongatus PCC 7942, will produce and secrete sucrose to feed our recombinant E. Coli through the expression of heterologous sucrose transporters. Figure 1: Blue light repression system. Pblrep LuxCDABE construct is shown on the left. Under blue light, the EL222 DNA binding protein dimerises and binds its binding region within the designed Pblind promoter, positioned between the -35 and -10 regions of the RNAP binding site, causing steric hindrance to RNAP binding, ultimately repressing transcription of LuxCDABE. Figure adapted from Jayaraman P. et al. (2016). On the right, there is a representation of our bacteria powered light bulb consisting of E. coli cells expressing this construct and EL222 construct, co-cultured with Synechococcus elongatus PCC 7942 expressing heterologous sucrose transporters.